When I decided to write the My Favorite Things feature on MIP, I wrote down a list of things, sites and organizations that definitely fit “the bill” for My Favorite Things. As I was perusing it today, I realized that the word “Samsung” is sprinkled throughout that list. First, the hubby, son and I are all addicted to our Samsung Galaxy phones. The phones features are simple to use, making what was really complicated on my old cell phone a breeze. They seem to get excellent reception unless you’re in Bonga-Bongaland and even I, who was the last of the Razor flip-phones users can figure out how to easily do what I most need when I’m “on the run.” I do confess that I’ve never had an iPhone and if I did have one, I might wind up being addicted to that more than my Samsung. But, I don’t have to wait in lines to get the latest phone; I don’t have to take Xanax when the phone is updating its software and operating system, and in case you hadn’t noticed, even iPhone is making bigger, thinner phones to compete with ol’ Samsung. Samsung, never slow to compete, has already come up with a “Mini” version of its Samsung Galaxy S 4 and it is now the phone of my dreams. It fits in the tiniest of jeans pockets securely and most of the time I don’t need my reading glasses to see the display clearly. Because of its smaller, thinner design, I can now go “one-handed” like iPhone users. Thus, I don’t feel very compelled to use an iPhone. If Android doesn’t have the app that iPhone does, trust me–it will in just a few weeks or months. Next, is my Samsung LCD TV. The best part? We never bought this TV. It was a corporate anniversary gift to my hubby for his years of service to them. It has a great picture, is the perfect size for our bedroom, operates easily and handles the voluminous DirecTV package that we carry. It’s my favorite TV in a house with 3 really good TVs. It has been going strong for over 6 years and doesn’t show any signs of slowing down soon. When my enormous side-by-side refrigerator began looking like it had been through a war (largely because it had survived a crazy, active family of five and because it never quite worked right from the beginning), the hubby and I fell in love with a Samsung refrigerator with a freezer on the bottom, a drawer in the middle and side-by-side doors with the fancy water/ice dispenser up top. The flexible shelving (where I can push part of one shelf back for taller items “on the fly”), the use of every nook and cranny of space, and the see-through plastic shelving all make the refrigerator portion easy to use and clean. I do wish that there was a butter dish compartment and maybe the egg compartment in the door, but I can live with the eggs and butter being on a shelf. And I confess that some days I do yearn for more space, but that is only during the holidays when I’m cooking for a battalion. The middle drawer is the feature everyone loves and guests rave about. It has 4 adjustable compartments. We have ours configured for soft drinks, cheese, meat and wine bottles. The push-button panel at the front of the drawer allows its owners to change the temperature of the drawer to whatever is needed at the moment without affecting the freezer or the refrigerator. It holds way more than one would think and when it opens, Maizie, our resident canine princess, knows something is going on in the kitchen that is worth investigating and she instantly sits down (to show she’s a model citizen) and give us her best “puppy eyes.” This just tells you how often we use this drawer! Even the dog knows its opening and closing means dinnertime! The freezer has a shelf on top that slides in and out and two deep compartments below. There is even a slim tray at the top of the door for frozen juice containers and the middle of the floor of this tray will even pop up and out of the way so that you can store frozen pizzas VERTICALLY in the bottom compartment to take up less space in the freezer. I have NEVER run out of space in this freezer and this is a freezer that is usually full of 19 ice packs (We like packing coolers to go on even the smallest of trips), at least 14 Lean Cuisines, leftover stew, chili, soup and chicken salad, the juice cans, some homemade ice cream from last summer, frozen meat and probably a few other things I’ve totally forgotten. My only complaint? That pretty stainless steel outside gets very fingerprinty. So, I’m constantly cleaning the outside of it. But, other than that, I adore it. Last but certainly not least are my Samsung front-loading washer and dryer. First, they’re in a calming medium-blue color. Since I’m not overly fond of laundry-folding duties, anything that one can do to calm me down is probably a good idea. It makes more of a difference than I thought a silly color would make. Next is the fact that I can set my washer to start washing clothes 8 hours from now. This avoids the mildewy problem and allows me to time when I will switch the laundry, fold it, hang it and put it away. It seems to clean the clothes better with less need for spot treating and it has a variety of settings where I can even add an extra wash or extra spin for any cycle selected. I can even change water temperatures, how much spin I want, and various other features to ensure that even my delicates get washed well and gently. As with other front-loading washers, it also seems to need less to do a better job than the old version. 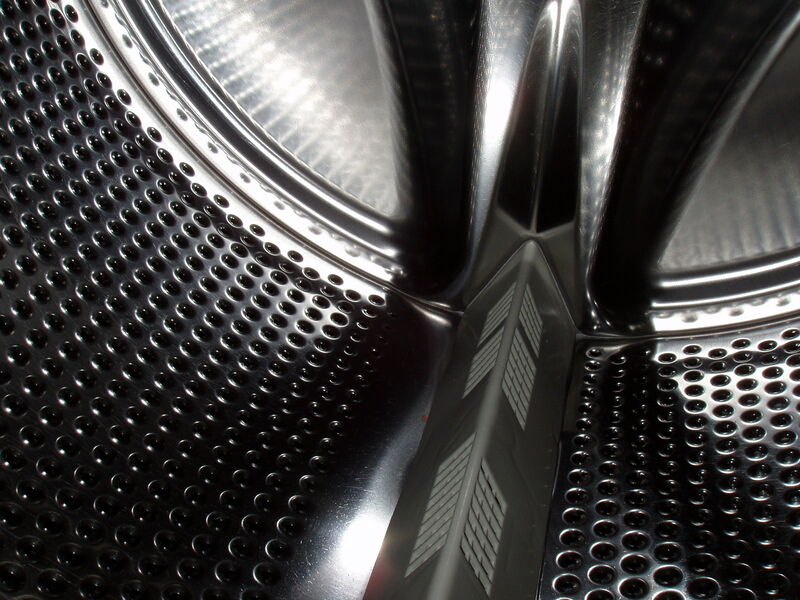 The dryer has a button that allows me to add additional time for the heavier loads–up to an hour and 40 minutes! And it’s wrinkle release cycle can’t be beat. I am slowly forgetting how to iron and that’s a major, because I am picky, picky, about wrinkly clothing. In less than 15 minutes I can put on the item that came out of the drawer way too creased. And no matter what cycle I select, it will continue to toss it around a few times and re-sound the “Done signal” to remind me to get to the dryer and fold/hang before I even need that Wrinkle Release cycle. We did note that moisture on the inside of the washer door can lead to the mildewy thing, so we have learned to just leave it open to air it out completely. And I am the first to say that, like all front-loading washers and dryers, they are not cheap! But they have been going strong for eight years and still don’t seem to be showing any signs of slowing down. I’m just now getting the first scratches on the top of them (where I do all my laundry folding and stacking). In an era of “built-in obsolescence,” I will take 8 years of non-stop top-notch performance. The weirdest part? We never intended to buy Samsung for any of the above! After reviewing the features available and the pricing for all sorts of brands for all of them, we came to the conclusion that Samsung was the savvy purchase. I don’t know what they’re doing over at Samsung, but they’re doing something right and I hope they keep right on doing it. Monday’s Post: Did you know the meaning of the WOW? This entry was posted on Friday, December 12th, 2014 at 12:45 pm and is filed under Fun Stuff. You can follow any responses to this entry through the RSS 2.0 feed.